It’s 1908. Eleven-year-old Innie Moretti loves the library club at the new settlement house for immigrant girls in Boston’s North End. She delights in borrowing books, listening to stories, dancing, and making friends. But soon strange things start to happen at the settlement house. Items go missing or turn up in odd places. Is it a thief—or could the house be haunted? There is a cemetery just across the street. As Innie tries to solve the mystery, she starts looking guilty herself! For discounted quantity purchases, please call 1-866-478-0556. Do you ever get tired of getting advice? One of the hard things about being a kid is that grown people, especially parents, seem to think they need to make suggestions about everything, from how a person should dress to the best way to eat spaghetti. Most kids I know can’t wait to grow up so they don’t have to hear all that advice any more. Guess what? My fiftieth birthday has come and gone, I’m a grandmother, and my parents are still giving me advice about all sorts of things, including suggestions about what might make a good story to write next. Mostly, it’s my dad: “You really should write about . . .” or “I had a great idea . . .” Unfortunately, while his ideas might make good stories for him to write about, most of the time they don’t seem to fit my imagination. 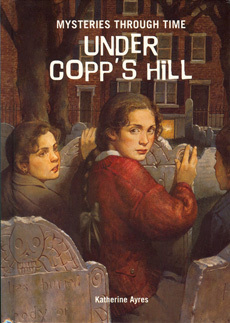 Under Copp’s Hill is an exception. He’d been watching the Antiques Road Show on TV and saw a story about the Saturday Evening Girls, a group of young women who lived in Boston’s North End in the early 1900s. They attended classes at a settlement house and worked in a pottery, producing beautiful, hand-painted plates and vases. That captured my imagination and I began to do some research. The more I learned about the house at 18 Hull Street and the girls and women who gathered there, the more I wanted to write about them. It helped that I’d lived in Boston for five years and loved the city. It also helped that we have family in Boston so I could combine a research trip with a fun visit. 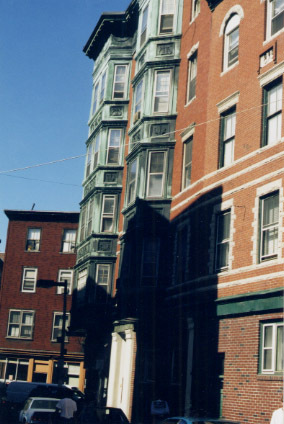 The biggest boost for me came when I made contact with a researcher who had studied the settlement house and pottery, also known as the Paul Revere Pottery because of its location, just down the street from the Old North Church. She kindly shared her research and the advance text of a book she was writing for adults. The city of Boston also helped me write the story. As I often do when planning a book, I explored the neighborhood with my camera slung about my neck, taking photos of the places that might appear in the story. As I walked up Salem Street, snapping pictures, the wonderful smells from the many Italian restaurants made my stomach growl. When I reached Hull Street and turned down, looking for number eighteen, I discovered a tall, four-story redbrick house. To fit more of the building in the photograph, I stepped backwards across the narrow street. Imagine my surprise when I looked over my shoulder and saw a graveyard. Here I was, writing a mystery, and the house where most of the action would take place sat across the street from a graveyard! And not just any graveyard, but the historic Copp’s Hill Burying Ground, where remains of many colonial settlers lie under old-fashioned tombstones. One of the stones (above) was used for target practice by British soldiers during the American Revolution. You can put your fingers into the bullet holes! Other true and interesting parts of the story came from the real history and people of Boston, including the nastiest and most creepy place in the book. I won’t tell you what that is, but when you get to that spot, you’ll know it’s a real place, now boarded up. And what the girls find there is a real object, found by some boys who lived in the neighborhood sixty years ago. What about Innie? Where did she come from? Because I’m not Italian, I had to do lots of research about Italian culture, food, family life and names. A friend shared names from her family and when she said Innocenza aloud I knew I’d found my main character. Imagine how hard it must be to have such name, which would translate into English as Innocent. Maybe I’m just a rebellious person, but if my family gave me a name like that, I’d feel obliged to act up and cause trouble. So Innie’s personality began to grow in my mind and the more she misbehaved, the more I liked her. children, now grown, including a Boston woman whose mother was a Saturday Evening Girl. As she spoke about her mother’s life and friendships she had made in the settlement house, I understood the heart of the book I hoped to write. These girls, newcomers, made friends in spite of differences in language and traditions and the objections of their strict fathers and older brothers. What spirit! And what a legacy they leave for all of us who follow.